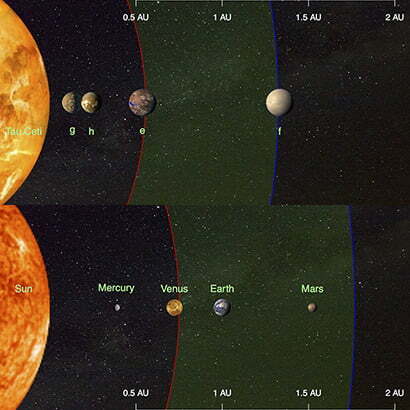 Four Earth-sized planets orbit our nearest sun-like star, Tau Ceti, according to a new study from an international team of astronomers. With masses as low as 1.7 the mass of Earth, the exoplanets are the smallest ever discovered around a nearby sun-like star, and two orbit within the star’s habitable zone. What’s more, the detection method used by the research team represents a milestone in scientists’ ability to detect exoplanets by picking up on extremely slight movements in stars. “We detected the planets by measuring the tiny periodic wobbles caused to the host star, Tau Ceti, by the gravitational pull of the planets orbiting it,” Mikko Tuomi, an astronomer from the University of Hertfordshire and coauthor of the study, told Digital Trends. Astronomers use a handful of techniques to spot exoplanets, including direct imaging and measuring the decrease in brightness as a planet passes in front its star. Toumi and his team used a method called radial velocity, which detects a star’s subtle movements caused by the tug of an exoplanet. But, since radial velocity relies on the pull of a planet, it is typically used to detect relatively massive planets. Tau Ceti is so similar to our sun that Toumi says, “they might as well be twins.” At just twelve light years away, the discovery of these exoplanets makes the system a place of increasing interest. But, even though two of the planets are in the star’s habitable zone, it’s unclear whether they’re actually habitable or support liquid surface water. To find out, astronomers would need to use direct imaging to study the objects. That is beyond our current reach, but Toumi is optimistic that future giant ground-based telescopes or next-gen space telescopes will make that possible. A paper detailing the research, which was accepted by the Astronomical Journal, is available online.